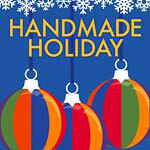 Friday-Sunday, November 23-25, Saturday-Sunday, December 1-2, 2018 Handmade Holiday 2018: Craft As Gift Show 10:00am-4:00pm. Admission is free. Holiday gift shoppers and art lovers “go local” at this high quality sale that features jewelry, handmade apparel, quilts, children’s toys, cutting boards, baskets, ceramics, tin sconces, paper crafts, birdhouses, soaps and lotions, holiday ornaments and an array of delectable edibles made by dozens of Columbia, Ulster, and Berkshire area artisans. See the full list of vendors. This year’s Handmade Holiday participants include Andrea Angerame, Amanda Bagnato, Martha Belardo, Brenda Bertin, Karen Boyd, Michael Boyer, Diane and Bill Brynda, ChocolateSprings, Frances Culley, Pamela Dalton, Allan Davidson, MaryAnne Davis, Marian Day, Bina Evans, Walter Fleming, Joyce Flower, Page Ginns, Lisa Goodman, Ulrike Grannis, GrantPress, Sarah Haze, Wendy Hollender, Betsy Howard, Chesley Huber, Hudson Valley Seed Company, Dara Jenssen, Marybeth Ketz, Fran and Kim Knapp, Agnes Larcenaire, Ben Lebel, Maya MacLaughlin, Bill Morency, Jan Moseman, Katie Nare, Clarke Olsen, Sherrie Petrie, Elizabeth Post, Tony Romeo, Barbara Rosenthal, Al Schulze, RobinSills, Alexis Silver, Grace Silvernale, Leni Singerman, Sumiko Takeda, Jeff Ulmer, Marlene Vidibor, Vivian Wachsberger, Fahari Wambura, Jackie Wilder, Betsy Winters-Russell and Sandy Wooding.